Idea Cellular Slashes 70% off on its Internet Browsing Idea 3G Internet Prepaid data Plans. Here are Information of all changed idea 3G Prepaid plans for all Indian states/circles, select from below. Find out 3G plans for India circle: Andhra Pradesh, Assam, Bihar & Jharkhand, Delhi, Gujarat, Haryana, Himachal Pradesh, Jammu and Kashmir, Karnataka, Kerala, Kolkata, Madhya Pradesh & Chhattisgarh, Maharashtra and Goa, Mumbai, Orissa, Punjab, Rajasthan, Tamilnadu, Uttar Pradesh East-West and West Bengal. i. 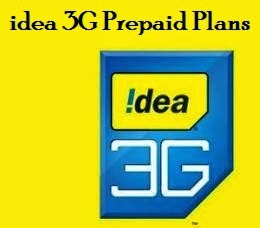 To check 3G usage for idea prepaid users: Call *125# To check 3G-2G usage from your idea number, This will show Idea GPRS data balance for both 3G and 2G. Stay tuned!! We will publish all the idea India circles plans soon.